Sen. Elizabeth Warren (D-Mass. 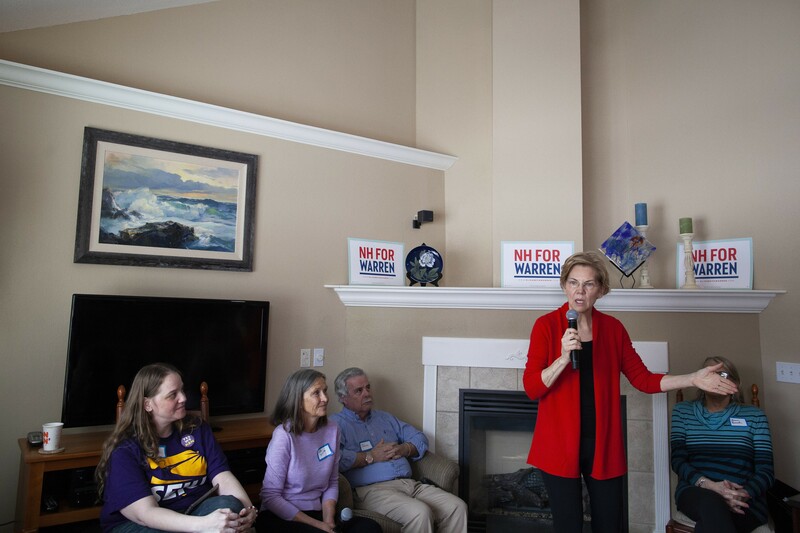 ), a Democratic presidential hopeful, speaks during an event at a home in Laconia, N.H., Feb. 23, 2019. Warren is set to announce a regulatory plan aimed at breaking up some of America’s largest tech companies, including Amazon, Google, and Facebook. Sen. Elizabeth Warren, the Massachusetts Democrat who is bidding to be the policy pacesetter in the Democratic presidential primary, announced another expansive idea Friday: a regulatory plan aimed at breaking up some of America’s largest tech companies, including Amazon, Google, Apple and Facebook. The proposal — which comes on the same day Warren will hold a rally in Long Island City, the New York neighborhood that was to be home to a major new Amazon campus — calls for the appointment of regulators who would “unwind tech mergers that illegally undermine competition,” as well as legislation that would prohibit platforms from both offering a marketplace for commerce and participating in that marketplace. Warren’s plan would also force the rollback of some acquisitions by technological giants, the campaign said, including Facebook’s deals for WhatsApp and Instagram, Amazon’s addition of Whole Foods, and Google’s purchase of Waze. Companies would be barred from transferring or sharing users’ data with third parties. Dual entities, such as Amazon Marketplace and AmazonBasics, would be split apart. During a brief interview later in New York, Warren refused to say whether Gov. Andrew Cuomo was right to have offered hefty tax incentives to Amazon in return for the proposed campus in Queens. Boston Mayor Martin J. Walsh, from Warren’s home state, also offered similar incentives. The announcement reverberated Friday from New York to Silicon Valley. Pressure for elected officials to place additional oversight on mega-tech companies has been building for months, particularly after revelations that companies such as Facebook may have violated customer privacy agreements.